From the Author: I spent a good fraction of my college days playing Dungeons & Dragons when I should have been studying. In the process, I discovered a wealth of ideas and techniques in how to play well and be a good Dungeon Master. I wrote these up in Dragon Magazine and others. One day I discovered that my list of topics looked more like a table of contents than a list of future magazine articles, so I began writing Through Dungeons Deep. The book went out of print when Reston Publishing went out of business. But demand for the book has never died. The original edition is being reissued by Norton Creek Press for far less than the going rate for the original Reston edition, which often sells for over $50. Just a note to wish you and yours a happy holiday, and to tell you how much I enjoy “Through Dungeons Deep” (the reprinted edition). Although I’m a DM with many years of experience, I still find new and insightful ideas in every chapter. The bits about your personal gaming group and characters are especially fun to read as well. I look forward to recommending it to my friends, who will undoubtedly enjoy it every bit as much as I have. Testimonials like this tell me that I was right to come up with a book that ignores game mechanics and focuses on what fantasy games are all about — playing roles, creating worlds, and having a great time. These require that you develop skills that have nothing to do with understanding the rules. I show you how to do this. Works With Any Rules System. This concept has withstood the test of time very well — I started out with Basic Dungeons and Dragons, but used Original Dungeons & Dragons plus Greyhawk and Advanced Dungeons and Dragons, too. 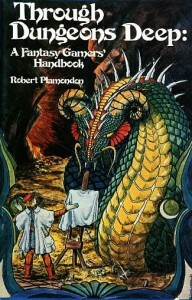 Later I ran customized campaigns based on a now-forgotten rules system called High Fantasy, and played in campaigns running undar any number of rules systems — RuneQuest, Traveller, Paranoia, any number of newer D&D editions, plus all sorts of other games. Right now I’m running a little campaign using my much-annotated Original D&D booklets. It’s all good, and my book is relevant to all of them, though it covers fantasy role-playing games better than other genres. Old-School Renaissance (OSR). Everything old is new again, and there has been renewed interest in the classic role-playing systems and the classic techniques in playing them well. I hope the book will help a new generation of players and Dungeon Masters learn the ropes more quickly, and get more excitement out of the game. With all the emphasis these days on the different flavors of Dungeons & Dragons, people sometimes lose track of the fact that the rules are really of secondary importance. Everything important is really up to the players and the Dungeon Master, and we all need a little guidance to start moving down the right path. You definitely want to buy this book if you’re new to playing or dungeon mastering, or have some beginners to bring up to speed, or could use a few more tips. So take a look at the sample chapters and and scan the table of contents below. Look good? Then Buy a Copy! Chapter 1. What are Fantasy Role-Playing Games? Chapter 11. Becoming a Game Master. Chapter 13. Creating a Campaign. Buy on Amazon in paperback or Kindle format. Or see our How to Order page.